While I’m not a “golfer” by most definitions, I do love hiking and found Scottsdale to offer a myriad of rewarding, challenging and relaxing hiking trails. Hiking gives you an appreciation for the natural beauty of the region, offers excellent physical and mental health benefits, and is definitely less frustrating than golf. 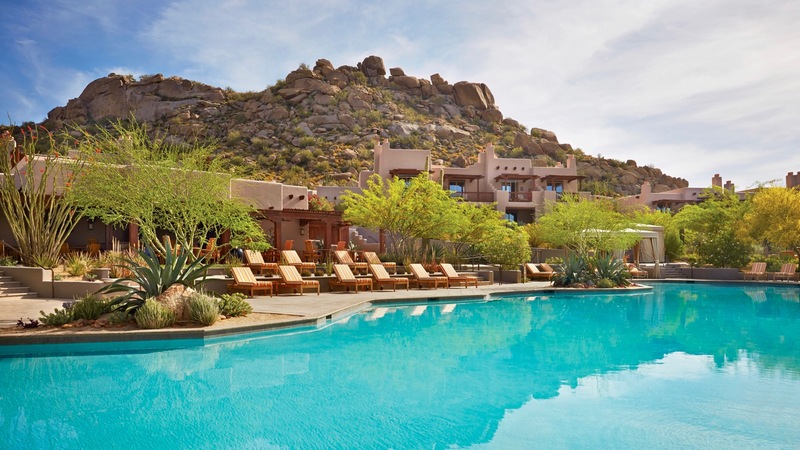 In the shadow of two of the region’s most popular hikes – Pinnacle Peak and Tom’s Thumb – the uber-luxurious Spa at Four Seasons Scottsdale Troon North is your perfect reward for tackling the hills. And nothing feels better after a hike than a swim in the resort’s Olympic-size swimming pool, a soak in the hot tub and receiving the kind of service you would expect from a Four Seasons. With exercise out of the way, tackle your appetite at Proof, the resort’s American canteen. Offering a selection of food from across all 50 states, Proof tempts you with a wide variety of wines, craft beers and cocktails. The restaurant gushes with attention to detail, from the clever menu to the fun and eclectic interior complete with a shuffleboard table and a railroad track running through the dining room. And most importantly, the food at Proof is delicious. I went with the healthier option of Mango-Coconut Ahi Poke, which was perfectly paired with an Elk Cove (Oregon) Riesling. After lunch I made my way to the spa a few steps away. The Spa at Four Seasons is as luxurious and understated as you would imagine. Not huge, but it offers everything you would expect: comfortable robes, soft linens, an awesome sauna and steam room, and professional, friendly staff. I planned to have the spa’s signature Golfer’s Massage. What differentiates this massage from others is that it is active, combining a deep therapeutic massage using warmed golf balls with stretches designed to knead tight muscles and joints. I’m not a golfer, but definitely would consider becoming one after this treatment. Waking out of my slumber, my therapist presented me with a cool glass of water and a chocolate-covered strawberry … again exceeding my expectations on the smallest detail. Tip #1: Non-resort guests can enjoy day access to the resort’s exclusive pools with the purchase of any 50-minute treatment at the spa. Adult guests can enjoy the adult-only pool, family pool and children’s pool for the day. Simply reserve an appointment by calling the spa in advance, and on the day of the treatment, take advantage of checking in early and spending a relaxing day poolside. Tip #2: Whether you’re looking for an easy or challenging hike, check out Experience Scottsdale’s take on the area’s best hikes.